A respected think tank has urged George Osborne to explain where the big cuts, pencilled in in yesterday's Budget will fall. The Institute for Fiscal Studies says that should be before the election. 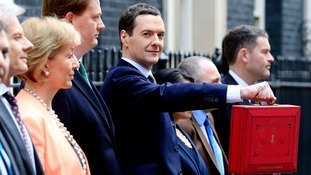 The Chancellor merely insisted future cuts would be no worse than those already achieved. Labour claimed he could only balance the books by increasing VAT or cutting NHS spending. An attempt by the Lib Dems to deliver an "alternative budget" ended in farce. The Conservative Party chairman Grant Shapps has hit back at criticism of an advert he tweeted celebrating the cuts in bingo tax and beer duty. The party advert said the measures were "to help hardworking people do more of the things they enjoy". The Tories and Mr Shapps were accused of being "condescending" by Labour and the Lib Dems. On a trip to Carlisle, he told BBC Radio Cumbria: "We can all argue about whether the word should be 'they' or 'us' or whatever. "Personally, I drink beer and I love a game of bingo so I can't see why on earth they think this is more important than talking the long-term economic future of our country, supporting actually sectors like bingo or the local pubs." The Conservatives' online Budget ad has been described by Ed Balls as "patronising and embarrassing". The Shadow Chancellor held a printout of the online-only poster in the House of Commons as he said it poster showed the Tories were "out of touch". The number of people paying the higher rate of tax has soared by two million since the coalition government took power, according to the Institute for Fiscal Studies (IFS). One Twitter user came up with a new way of spoofing yesterday's Budget, following measures aimed to please beer drinkers and bingo-goers. Nick Clegg has described the Conservatives' online Budget advert as "silly" but denied that George Osborne's statement marked a "Budget for plebs". "It was a coalition budget through and through," the deputy prime minister told a caller on his regular LBC radio phone-in. "I am really very proud of all of it," he added. There is no question of the Conservatives' 'patronising' online Budget advert being pulled, a senior source has said. The source said it could not be withdrawn as it was not part of a wider campaign involving other media such as TV and radio. But they added: "We are quite proud of those tax cuts... We stand by what was said in that advert." George Osborne said Labour was only attacking the Conservatives' Bingo duty advert "because they don't have anything else to say about the economy." The Chancellor told Daybreak he was "proud" the budget was helping with tax on Bingo so the halls could stay open. A Labour Government will support George Osborne's cap on welfare spending, reigning in the total budget for the department to £119bn, the shadow chancellor told Daybreak. However, Ed Balls warned Labour "would do things differently" within that cap, like scrap the bedroom tax and provide a guaranteed job for young people. Q&A: How does the Budget affect you?